Strategic Mobility Group, LLC (SMG3) has announced an imperative partnership with Vigilant Labels to further develop a robust RX healthcare solutions portfolio (SMG3RX). This partnership unites a leading technology solutions provider with an essential platform that has reimagined the future of medication labeling processes for anesthesiologists and CRNAs. Click-to-Comply offers healthcare providers improved workflow in the operating room, while concurrently decreasing preventable medical errors. However, the beauty of the Click-to-Comply solution lies in its simplicity; a comprehensive labeling system is delivered in just two clicks. “We are constantly architecting our solutions to better benefit hospitals and healthcare providers in a fast and challenging technology industry. Adding innovative partners like Vigilant Labels, who solve specific and prevalent problems in healthcare environments, enables SMG3RX to coordinate the seamless integration of essential services and technologies into any hospitals ecosystem," says Eric Holmes, Co-Founder of SMG3 & Vice President of Sales. Accurate labeling and organization in hospitals and healthcare systems is pivotal in preventing accidental injuries and deaths. With SMG3RX and Vigilant Labels, healthcare providers can establish a safe and continual culture of care for patients by utilizing a simplified, ready-to-use platform that benefits anesthesiologists, CRNAs, Pharmacists, OR Managers, and Hospital Leadership. Click-to-Comply also adheres to strict regulatory guidelines. 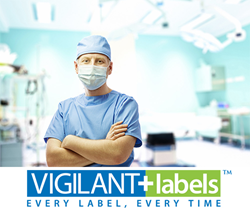 Vigilant Labels provides products and software for complex labeling requirements in the Anesthesia, Nursing and Pharmacy segments. Our industry-leading Click-to-Comply software delivers on the promise to maintain compliance, improve workflow, enhance safety and control costs. Our unique ability to deliver fully compliant, integrated bar code labels for syringe medications and more is unparalleled in the industry. For more information please visit http://www.vigilantlabels.com.